Was Darwin wrong about emotions? ~ Health Matters Today! Contrary to what many psychological scientists think, people do not all have the same set of biologically "basic" emotions, and those emotions are not automatically expressed on the faces of those around us, according to the author of a new article published in Current Directions in Psychological Science, a journal published by the Association for Psychological Science. This means a recent move to train security workers to recognize "basic" emotions from expressions might be misguided. "What I decided to do in this paper is remind readers of the evidence that runs contrary to the view that certain emotions are biologically basic, so that people scowl only when they're angry or pout only when they're sad," says Lisa Feldman Barrett of Northeastern University, the author of the new paper. 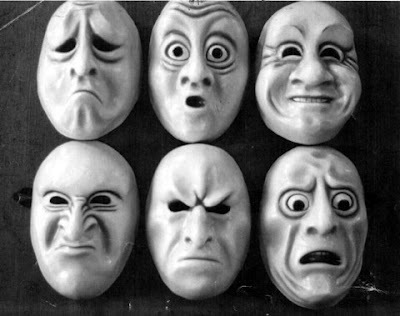 The commonly-held belief is that certain facial muscle movements (called expressions) evolved to express certain mental states and prepare the body to react in stereotyped ways to certain situations. For example, widening the eyes when you're scared might help you take in more information about the scene, while also signaling to the people around you that something dangerous is happening. But Barrett (along with a minority of other scientists) thinks that expressions are not inborn emotional signals that are automatically expressed on the face. "When do you ever see somebody pout in sadness? When it's a symbol," she says. "Like in cartoons or very bad movies." People pout when they want to look sad, not necessarily when they actually feel sad, she says. Some scientists have proposed that emotions regulate your physical response to a situation, but there's no evidence, for example, that a certain emotion usually produces the same physical changes each time it is experienced, Barrett says. "There's tremendous variety in what people do and what their bodies and faces do in anger or sadness or in fear," she says. People do a lot of things when they're angry. Sometimes they yell; sometimes they smile. "Textbooks in introductory psychology says that there are about seven, plus or minus two, biologically basic emotions that have a designated expression that can be recognized by everybody in the world, and the evidence I review in this paper just doesn't support that view," she says. Instead of stating that all emotions fall into a few categories, and everyone expresses them the same way, Barrett says, psychologists should work on understanding how people vary in expressing their emotions. This debate isn't purely academic. It has consequences for how clinicians are trained and also for the security industry. In recent years there's been an explosion of training programs that are meant to help security officers of all kinds identify people who are up to something nefarious. But this training might be misguided, Barrett says. "There's a lot of evidence that there is no signature for fear or anger or sadness that you could detect in another person. If you want to improve your accuracy in reading emotion in another person, you have to also take the context into account." Incidentally, the theory that emotional expressions evolved for specific functions is normally attributed to Charles Darwin, in his book The Expression of the Emotions in Man and Animals. But Darwin didn't write that emotional expressions are functional. "If you're going to cite Darwin as evidence that you're right, you'd better cite him correctly," Barrett says. Darwin thought that emotional expressions – smiles, frowns, and so on –were akin to the vestigial tailbone – and occurred even though they are of no use.